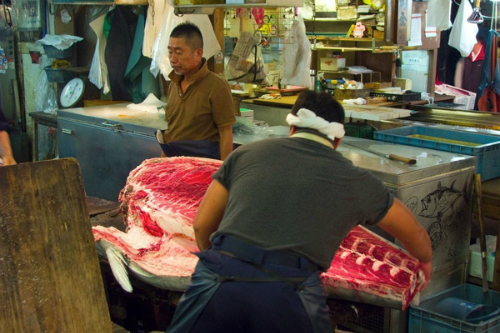 Tsukiji market in Tokyo (Japan) consumes approximately 2.000 tons of seafood per day with thousands of products from tiny menhaden to tuna weighing 300 kg. 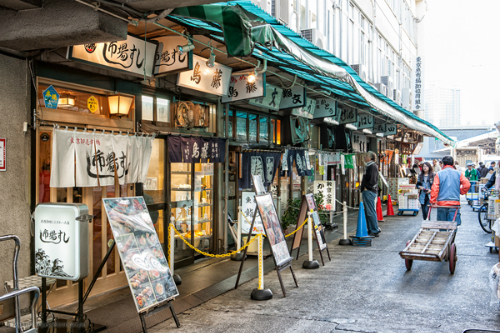 Amidst Sumida river and Ginza first-rate central shopping mall is Tsukiji market. 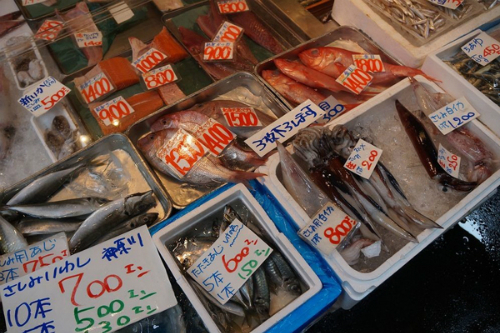 Tsukiji fish market is 285.000 m2 in square and famous for seafood products. Everyday, there is about 2.000 tons of seafood consumed here is exported to many other places. This is the biggest seafood in the world. The first fish market is Uogashi which was founded in 16th century. But after the earthquake in 1923, it was destroyed. 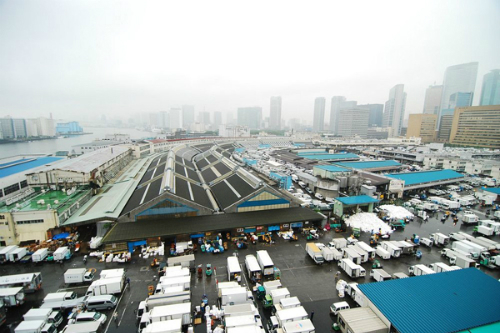 As a consequence, fish market was changed into Tsukiji district. 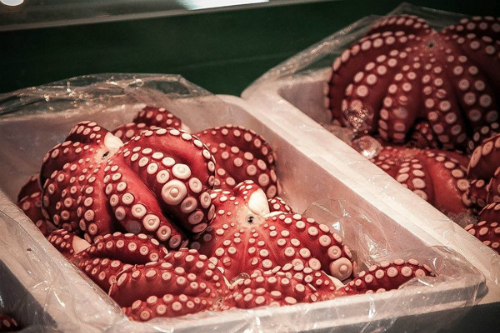 Since 1935, Tsukiji has become one of the famous tourist attraction spots in Japan’s capital. Tsukiji fish market sell over 400 various types per day, from seaweed to the most expensive caviar, and from tiny menhaden to tuna weighing hundreds of kilograms. Even more, it also sells whale meat. 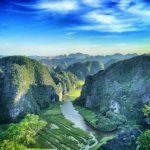 It is estimated to have about 700.000 tons of seafood valued up to 5,9 billion USD that is sold here per year. The most famous one of this area is a tuna auction which the sale price grows up to thousands USD for a fish. In 2013, the owner of Kiyoshi sushi restaurant set a record when paying 154,4 million Yen (about 1,3 million USD) for a bluefin tuna weighing 222 kg. 3 am is the time when customers start to queue to have a visit and see an auction. The auction begins at about 5:30 am and ends at 10 am. 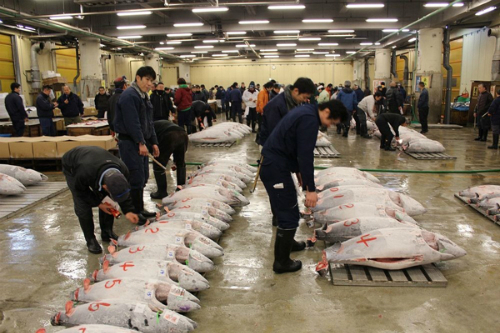 After fishes are bought, the sellers will cut and prepare to deliver to retails platforms and restaurants. 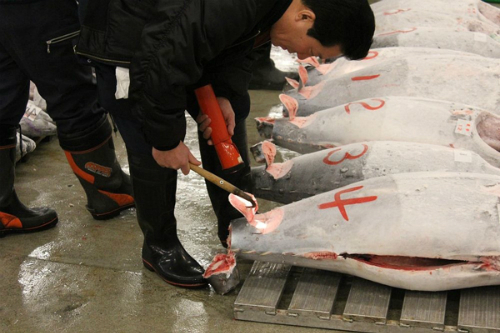 Concerning big fishes such as tuna and whale, they need a such more complex preliminary treatment process. 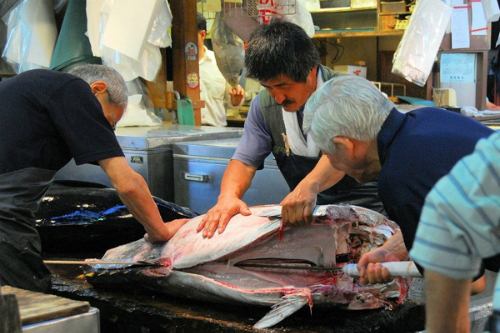 Frozen tuna and swordfish are usually cut with saw blade. 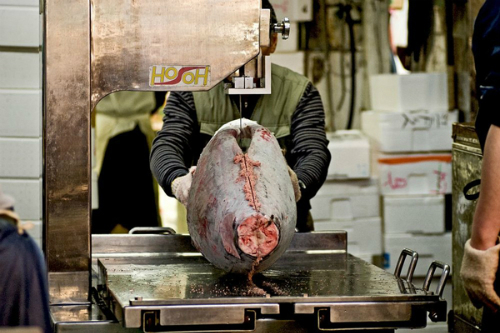 To cut a big tuna, people use a knife with over one meter length. On 4/1/2016, the final auction of this 80-year-old seafood market was held because Tsukiji will be moved to a new place in Tokyo bay. Tokyo city is planning to build up this place as a preparation for Olympic 2020. Tsukiji fish market has 2 zones, inside and outside. Inside the market is the area for eating and drinking shops or raw material places. Outside is the area for tourists. 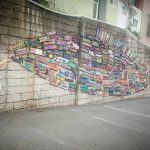 Tsukiji has many famous eating and drinking shops with several tasty, eye-catching dishes that is irresistible like Sushi, Kaisendon, which is made out of fresh seafood, Ramen noodles, Gyudon, and chicken majored shops.